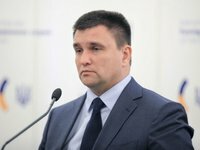 The declaration of Article 368-2 of the Criminal Code of Ukraine on illegal enrichment as unconstitutional by the Constitutional Court of Ukraine does not create the risks for the visa-free regime for Ukrainians with the European Union (EU), Ukrainian Foreign Minister Pavlo Klimkin said in Kyiv on Thursday, March 7. Asked by Interfax-Ukraine about any negative messages from representatives of the European Union (EU) regarding the possible cancelation of the visa-free regime for Ukraine due to the above-mentioned decision of the Constitutional Court he said that there are no such messages. "I think that this [availability of the illegal enrichment article in the Criminal Code) is a matter of principle for us. This is in fact a sanction for us in the context of fight against corruption," he said. "That is, no one will punish Ukraine. It is we, and not our friends, who should apply any punishments to us, so that we can go the way of fighting corruption," Klimkin said.